What did the ancient Israelites really think about King David? King David has become one of the most popular and beloved heroes in the entire bible. But how was he perceived by those who knew him in the time that he became ruler over the Hebrew people? 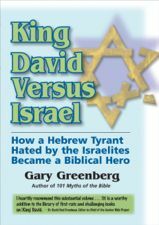 In this challenging and controversial biography Greenberg offers compelling evidence that David was widely despised among the ancient Israelites, that he attempted a military coup to overthrow King Saul, that he arranged for the assassination of his various opponents, that he allied himself with the Philistines against Israel, and that he conquered Israel by force of arms and relied on Philistine allies to keep himself in power against ongoing popular resistance from the people of Israel. ● David did not kill Goliath. In the original story the hero was one of King David’s soldiers. ● There are two conflicting stories in the bible about how King Saul died, both attempting to overcome the fact that David was found in possession of incriminating evidence linking him to Saul’s death. ● David became king of Judah while Saul was still king over Israel and allied Judah with the Philistines against Israel. ● David became king of Israel only after waging a two-year civil war against King Eshbaal, the son of Saul and Israel’s legitimate king after Saul’s death. ● One popular military rebellion against King David temporarily removed him from the throne and a second popular rebellion threatened to do the same.